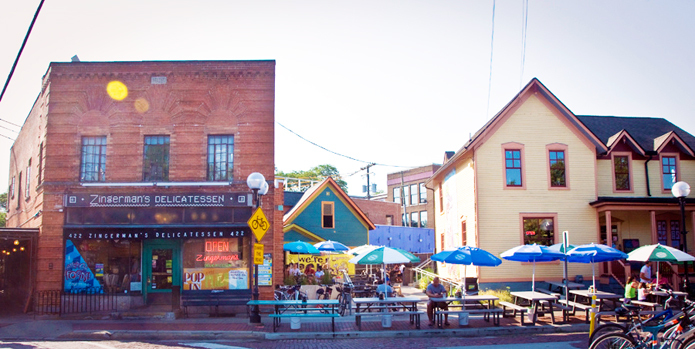 Not only is Zingerman’s Delicatessen a favorite of Oprah Winfrey’s, along with a majority of visitors, but the deli has become a popular destination within Michigan and worldwide. USA Today even named Zingerman’s one of the country’s top ten places to a buy “a genuine Jewish Nosh.” But keep in mind, Zingerman’s Deli is a lifelong commitment – once you’ve had it, there’s no going back. Thirty years ago, Paul Saginaw and Ari Weinzweig started the deli in a historic building in the heart of a local farmer’s market. The menu has grown substantially since then, and, branching from strictly Jewish cuisine, it now carries a range of fantastic offerings including sandwiches, wine, cheese, free-range chicken and turkey, premium beef and pastrami, as well as a variety of fish, breads, coffees and spreads – thus essentially creating a small market where quality and originality is fundamental. Zingerman’s Deli was originally supposed to be named after Hannah Greenberg, a faithful and loyal customer of Saginaw’s previous venture. However, after filing the paperwork for the two co-owners to begin their business enterprise, they were unable to use the name. Once deciding both of their family names were either unpronounceable or had non-Jewish connotations in Michigan, they decided on Zingerman’s, most notably for being easily spotted in the directory. As a student of the University of Michigan, living so close to Zingerman’s and its addicting flavor and superiority, my friends and I often find ourselves strategizing when to attempt to grab a sandwich – because, no doubt, finding a line at Zingerman’s is as likely as finding yourself craving more. With that in mind, a line only means the food is good enough to wait for. And because of such high demand, the deli has worked hard to make your wait short and entertaining with thousands of trinkets and merchandised items to buy and enjoy. Oprah Winfrey’s favorite sandwich, #97 Lisa C.’s Boisterous Brisket, is said to rate an “11” on a scale of 1-5. Although you cannot go wrong with anything you order at the deli, another suggestion from a reliable source would be co-owner Ari Weinzweig’s favorite sandwich: #81 Oswald’s Mile High, a corned beef Jewish delicacy. The chef’s favorite sandwich is a #85 J/V/W/’s Detroit St. BBQ, made with Nueske’s applewood-smoked bacon, coleslaw and, most importantly, Zingerman’s BBQ Amish Chicken. Zingerman’s Deli, incomparable to other delis, continues to go even further to make sure its customers are happy. So, if you don’t live close enough to stop in but are a fan of the #18 Georgia Reuben, like so many other customers, be assured you don’t even need to make a trip to Ann Arbor – you can ship it right to your house. Included in your package to receive: Jewish Rye (Pumpernickel in Brooklyn Reuben), freshly sliced deli meat and Emmentaler Swiss cheese, as well as and Zingerman’s homemade redskin potato salad, coleslaw, Russian dressing, garlicky pickles and Magic Brownie Bites. Assembly is required, but definitely worth it. Because Zingerman’s incorporates everything imaginable, including the convenience of a mail-delivered sandwich, there is, of course, the option to cater as well. An event with Zingerman’s offers a deliciously unique aspect and an invite that no one can refuse. Whether a business meeting, gathering of friends, cocktail party or football tailgate (Go Blue! ), Zingerman’s is prepared to do the messy work for you. If you haven’t been enticed to visit and indulge at Zingerman’s Deli, the business’s confidence may change your mind – Zingerman’s is completely devoted to making the consumer happy and, in doing so, has agreed that, in the rare case that you find your meal unsatisfying, it is happy to provide a refund to maintain a good relationship. However, bear in mind that your taste in food may be forever questioned if you do, in fact, disagree with the celebrated Zingerman’s Delicatessen.